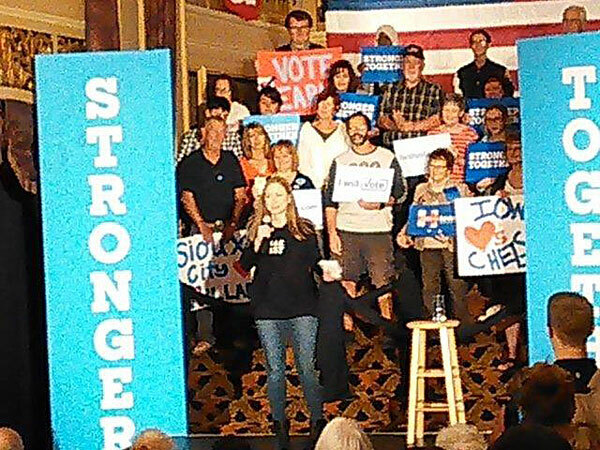 Chelsea Clinton in Sioux City. Hillary Clinton’s daughter told a crowd in Sioux City late yesterday afternoon that the country’s values “are at stake” in this year’s election. “I never thought I would see in my lifetime the almost normalization of hate speech that we are witnessing from the Republican nominee and his campaign,” she said. That was part of Chelsea Clinton’s answer to a woman in the crowd who said — while asking a question — that Hillary Clinton has been subjected to a “smear campaign” since the 1990s. Chelsea Clinton, who is 36, told the crowd she doesn’t remember a time in her life when her mother wasn’t being attacked. And she asked Iowans to examine her mother’s record. More than 100 people attended the event in Sioux City. Chelsea Clinton also made a campaign stop in Dubuque yesterday.